The Cleveland Browns will be playing the NY Jets during the 2019 NFL season and the Big Apple Browns Backers of NYC will be your official source for group tickets, tailgating info and everything else you need to know about the weekend. We’ll also be hosting the “Welcome Party” for all Browns Backers the night before the big game — hopefully with some Browns alumni and special guests in attendance. As soon as the official schedule is released (mid-April after the draft), we’ll be able to finalize details and launch our ticket portal for Browns Backers. Bookmark this page and check back soon after dates are official. Group Tickets: we’re running point with the Jets ticket office to guarantee dedicated group tickets for 4 different price tiers: Mezzanine A and B, 300 level prime, 300 level corner/endzone and club seats. Tailgate: we’re working to secure a massive area to accommodate all our rowdiness and pre-game hi-jinks to serve as a home base for all Browns fans in attendance. Welcome Party: we’ll be hosting the night-before-party for everyone visiting the Big Apple that weekend at our official viewing location, Brother Jimmy’s Murray Hill. Hue Jackson is out as head coach of the Cleveland Browns and this group of Browns backers couldn’t be happier. Jackson was an abomination of a coach, constantly making excuses for his ineptitude or wrongfully placing blame on just about anyone else except for himself. Facts don’t lie: Jackson’s 36 losses in 40 games are the worst for any head coach in the history of the league (note: we didn’t fact check this, but frankly, we don’t care). No coach has ever been more deserving of being fired: he made bad teams historically terrible, all while trying to place his own brand above deserved criticism. Alas, life as a Browns fan will continue even though winning football is far from assured. Knowing the Browns, it will get worse before it gets better. 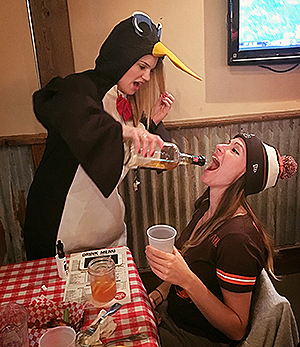 But we here at the Big Apple Browns Backers of NYC promise that we’ll continue to be there for you, providing a safe-haven for CLE fans every Sunday, offering a shoulder to cry on and serving up many, many beers and Penguin shots to momentarily forget your misery (and sobriety).